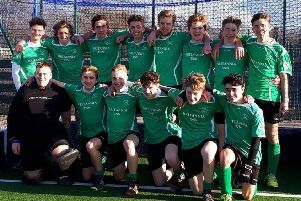 Defeat in their last match of the season denied Chesterfield any chance of the Second Division title in the Midland Men’s Hockey League. After beating bottom-of-the-table Nottingham Players 3-0 24 hours earlier, Chesterfield knew they had to win at fourth-placed Telord and Wrekin to keep alive their hopes of pipping Stratford to the champions’ crown. But they lost 3-2. Nevertheless, they still celebrated promotion as runners-up, and player/coach Christian Battye said he was happy with an excellent season. In a scrappy match against Players, goals from Australian Hugh Flassman (2) and skipper Michael Fearn guaranteed Chesterfield second place at least. But they conceded after ten minutes against Telford and although Jon Moores equalised, a frantic end to the first half saw the hosts lead 3-1. Man-of-the-match Joe Morton drove them forward in and end-to-end second half, but they could manage only a consolation goal from Flassman five minutes from time.